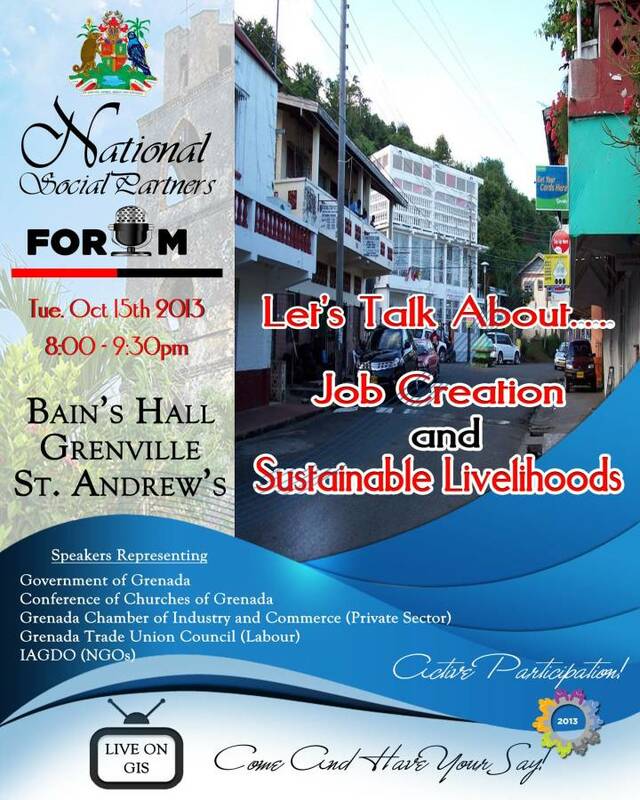 The Committee of Social Partners (CSP) will hold the second session in its public education series, on Tuesday, 15 October 2013, at the Bain’s Hall Conference Room, Grenville, St. Andrew’s, from 8:00 to 9:30 pm. The topic of discussion will be: Generating Jobs and Sustainable Livelihoods. To forge consensus on how we, as a Nation, work together for Grenada’s economic revival and prosperity. The first discussion in the series was held on 1 October 2013 at the Grenada Trade Centre Annex and dealt with the issue of restructuring the national debt. The Committee of Social Partners urges the general public to participate in the series either by attending or tuning in to the live broadcast. The Committee of Social Partners is made up of representatives from Government, Business (Private Sector), Labour Unions, Churches and Non-Governmental Organisations (NGOs).